Back in May, a group of brewers and other beer industry folk from Portland headed to Melbourne as the first guests in Good Beer Week's Good Beer Mates program. While here, the brewers from Breakside and The Commons hooked up with local brewers to create a beer. In each case, it was to be an Aussie twist on one of the American brewers' best known beers. For Breakside, this became an Aussie hopped take on its Wanderlust IPA; The Commons headed to Thornbury to reinvent its Urban Farmhouse Ale, again with local ingredients, as the Industrial Farmhouse Ale. 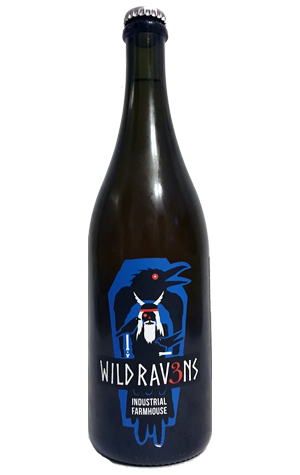 It appears as beer three of four in the current run of Wild Ravens mixed ferment beers and, despite being one of two in that run that doesn't feature grape juice, comes with vinous qualities. The initial hit has white grape qualities to it, while there's an apple-tinged acidity amid the peppery, drying, back palate tartness, presumably a result of blending in some of the brewery's barrel aged golden sour. In between, the malt and yeast comes into play – a bready sweetness, spicy aromas – while the beer fires off a little burst of farmhouse funk as a parting gift.